Traditionally, Kare-Kare is cooked with beef tripe, ox tail or leg. And uses freshly ground roasted peanuts and ground rice to make a thick and flavorful stew. Gladly, there are ready kare-kare mix now available in the market, so you wont have to do the grounding of peanuts and rice. 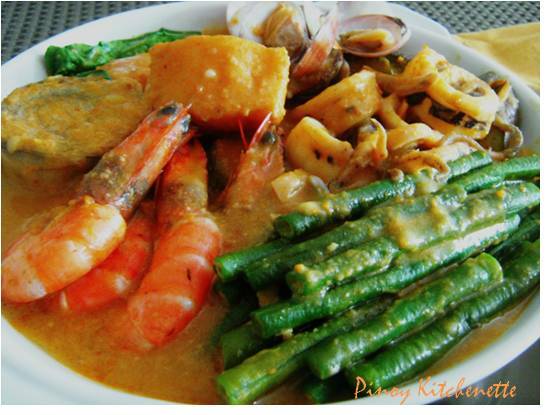 If you're not fond of eating pork or beef meat, you can have seafoods as substitute in cooking Kare-Kare. Though I used the ready mix, I still added peanut butter and atchuete oil (annatto oil) to add a richer taste. Wash the squids. Remove the ink. Cut into rings. Drain well.Set aside. Wash the shrimps. Trim.Drain. Set aside. Now, for the strict vegetarians my Tofu Kare-Kare is best for you. Recipe to follow. Featured Food of The Week #123. I just made kare-kare the other week and used beef ribs!! LOL! This looks yum! this is an interesting twist. i haven't tried seafood kare-kare yet but i'm willing to try. will probably do this at home one of these days. 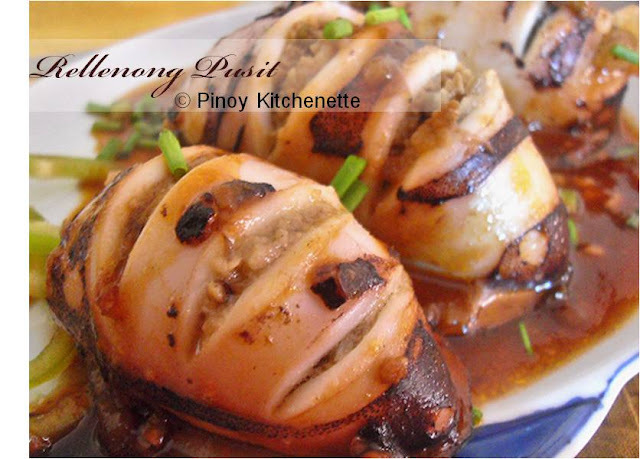 Healthy alternative from the usual meat based kare-kare..Looks delicious! Hi Anna!thanks for dropping by. Have agreat weekend. Indeed you must try this. Sarap ng seafoods. I even have my Tofu Kare-Kare which is very good for vegetarians and if im in my ala-diet-mode. Have a great weekend! thanks for dropping by! Have a great weekend. this is great! A combinaiton of my two favorite thing to eat in the world. Kare-kare and Seafoods! I love the abundance of seafood that you put together on this dish. It really breaks away from the tradition but it makes it so unique. Looks very delicious.